I've spent the last 6 days migrating Keen64 over to Unity and I got a basic skeleton of the first level done just in time for Keen Day! 1) Does the game run? 2) Does the gameplay run smoother than the Keen beta that I released before? How do I mean smoother? Well, with the beta made in Blitz3D, people kept running into problems with the physics and collision detection. So I want to make sure this at least works better than my previous beta, in that regard. Then I'll go in and fine tune the platforming more. The release style will be like before-- release a trickle here and there and let people try it out. Otherwise these kind of things just become monolithic. So I will update the thread name as I did before, with the main quest still being to remake Commander Keen: Marooned On Mars in full 3D while (reasonably) mimicking the style of the old N64 games. Also, I said before that Keen will have a new model and be re-animated. This still stands. So the current Keen model is essentially a placeholder. So why am I switching over to Unity? With most of it's main features offered for free. One hurdle I had with moving my projects over to Unity is that the in order to get camera screens mapped to a texture surface, which is a huge deal for a game like SoaceJourney, it required a pro version of Unity (cash I don't have right now to spend on an engine that I know next to nothing about). So now I realized that moving Keen64 over would be a good exercise in learning how to use Unity. I admit my main goal right now is to release levels now and refine gameplay later. Mostly because I feel I spent so much time fine tuning the Keen 64 demo that really went nowhere because I had to recode the whole thing. Also, there's just alot of things that have been a snag with Blitz3D that should work fine in Unity. Like getting yorps to collide with Keen while moving and the many collision \ physics issues people had that I mentioned above. When I started working on the Keen64 demo, I never saw it as just one remake, but rather, I wanted to see an entire Keen 3D community grow out of this. So if I can get this game finished, I'll release the Unity source files, which will be much easier for other people to modify than thousands of lines of code in a hybird language. In the other case, i.e. if I ever drop this project, whatever I've built so far in Unity will be released anyways. Sounds like a win-win for the Keen Community. Stuff like cel-shading and bump mapping, if I wanted to go that route, can now be seamlessly integrated. 4) Multi-platform and more flexible. Now people can play my games in their browser and those who use linux won't have to go through WINE. Also, newcomers will have more motivation to make new 3D Keen games, because their projects will be more accessible. Even though I had made some tech demos prior to Ronnie releasing his game on the forums (I might show some of these projects, one being a Duke Nukem clone and a medieval dungeon demo), seeing this project in action was good to see just how well Keen can work on Unity. If you haven't tried his game, please do so, it's awesome. Now that's not to say Blitz3D isn't a good platform. It's just outdated. But in using it for the last 8 years, I've learned how to code massive games by hand, like SpaceJourney and even make my own level editors. Last edited by Lava89 on Sat Jul 08, 2017 21:12, edited 29 times in total. It's so smooth I can't describe it (or I would, but it would be something nasty haha). Really, works wonderful. Congratulation for porting it to unitiy. That's a great idea. The gameplay however needs working. wiivn wrote: It's so smooth I can't describe it (or I would, but it would be something nasty haha). wiivn wrote: The gameplay however needs working. Could you be a little more specific, please? I know it's not perfect, but any ideas would definitely help in making it closer to perfect, haha. Okay, I've never played Keen64 before the unity port so I don't know how it played before. Having said that I find the gravity pretty low, I think Keen's jump shouldn't be so high. I was able to jump clear over the exit from two steps down. Still though I like it so far. Not used to the jumping. It's as if I expect to have much greater control in the air, even though that's not at all realistic. Loved Keen64. The mouse should be locked to begin with. chrissifniotis wrote: Okay, I've never played Keen64 before the unity port so I don't know how it played before. That's perfectly fine, in fact that right there tells me that moving to Unity was a good choice, because now someone has gotten to play the game that didn't otherwise. chrissifniotis wrote: Having said that I find the gravity pretty low, I think Keen's jump shouldn't be so high. I was able to jump clear over the exit from two steps down. Still though I like it so far. Yeah, I was tweaking the gravity and it seems to be part of the issue and I'll modify the jump height now, based on what you said. I'll only tweak it a little, to mimic the original game as closely as possible. Many thanks! @troublesomekeen: Ok, thanks for your input! I'll see what I can do about giving the player more control. @wiivn: Are you talking about the fact that you can move the mouse around while playing the game? If so, I'll see if I can change that. Wow, cool! I remember playing the original. I tried the Linux version (already noticing the benefits ). Here's some feedback! I gotta say it controls more easily than that old one did already! The initial view I saw was that of below the floor. For a moment, I thought the floor hadn't loaded. Make sure the camera simply can't get that low (OR make sure the camera cannot go through the floors and will instead move closer to the player. That also prevents stuff like this (you can see the floor ABOVE Keen)). And make sure the camera centers to a sensible default when the game starts. Control feels better than it was in the 2013 demo, but I see two main issues: jump height and mid-air control. First off, the jump height is always the same. Make sure it gets higher as you hold the button longer, and low when you only tap it. That is the Keen way and gives the player a lot more control. Second: the mid-air control. Once you make a jump, you can basically no longer correct your movements. You will be dedicated to that jump. Make a mistake, too bad, try again. Make sure that I can reverse my direction mid-air, or go sideways a little, anything to make mid-air control easier. There are also a lot of moments where I want to jump straight up and THEN decide my direction as I'm jumping. Like getting up a ledge right in front of me. So while this might be against regular physics it's definitely how the original games worked, and they were better off for it. Lower the mouse sensitivity, or give the option to. If I try to play, I easily make a 270 degree turn when I really just wanted to look 90 degrees to the left. Makes it spin a lot. When bumping your head, Keen doesn't quite hit the ceiling (there's some distance between him and it), and he doesn't bump back down right away (you probably know about this). Graphics: Keen looks positively spooked. You might want to add some eyelids (in the "mean" stance, to make him look confident). Some of the graphics are very harsh on the eyes. For example, this. I know it's all WIP, but I'm sure you can soften those colors a little bit. All in all: I think you made a good move continuing work in Unity instead, and it's showing in the initial quality you're putting down. Nice work, and I'd love to see this become better and better! Play via Browser or standalone Linux. I can also compile a standalone Windows or Mac package, if anyone wants \ needs it. First of all, I want to thank DaVince for his suggestions, as it gave me some good ideas of where to make changes. I also followed chrissifniotis's advice and increased the gravity. For some of the fun updates, I added yorps. They can't bump you, be shot, fall off ledges or even have some of the classic behavior (like their thinking routine), but I will add that down the road, once I'm more comfortable in Unity scripting. If you're curious how they'll eventually act in this game, I will refer you to the Keen64 Beta I made in Blitz3D. After I took that pic, I almost wanted to create a Yorp Herding Simulator. This was another pic I took in early development. I'd best caption it: "You saved our lives! We are eternally grateful!" 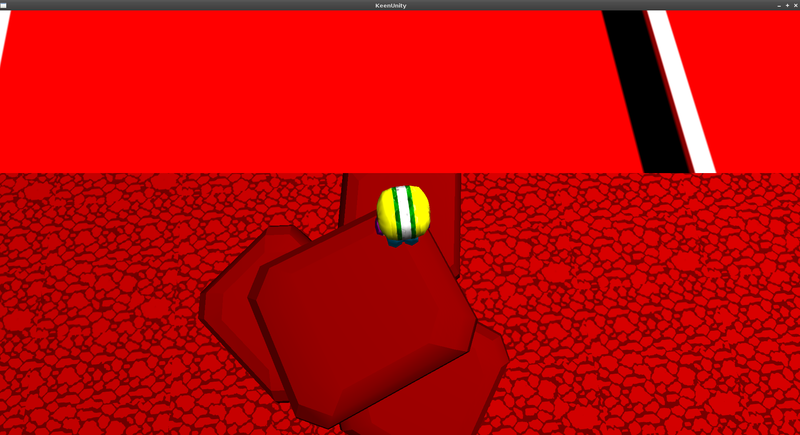 Also, I'm sure you can tell by the first screen that I added the lolliops. They don't count a score yet, but do disappear when you grab them, giving the player some incentive to try out the new controls. There will be more items in the next update. Fixed. Since the web version wants you to click in the game before letting you properly lock the cursor, I set it so that way it starts with the cursor visible and unlocked...then if you click and then press F9, it will hide and lock cursor. Press F9 again to re-enable the cursor. I picked F9 because F11 and F12 is used by alot of apps to fullscreen or take screen caps and F1 to F8 were used by old keen games or other games to save and load. Lower the mouse sensitivity, or give the option to. Good ideas... since I don't know enough about Unity (yet), I will try to have these fixed in the next update or so. Ok, I will definitely attempt to fix this for the next update. Second: the mid-air control. Once you make a jump, you can basically no longer correct your movements. Fixed. I had to disable alot of "smoothing" code in the Unity template I was using to get this to work, so it might feel a little clunky and the jump animation cue needs to be fixed, as a result. But I think it gives the player more control and once I get the community's feedback on how it plays, I will try to get what I have now to feel more polished. This might've been the result of the lower gravity, that I fixed. So hopefully this took care of itself, or at least isn't as extreme. If it's still a problem, I might look into alternative solutions. Some of the graphics are very harsh on the eyes. I fixed that specific example. If you find any other instances, feel free to point them out. Graphics: Keen looks positively spooked. For Keen's main model I am going to hold off from any changes until I can implement his updated model. Last edited by Lava89 on Tue May 09, 2017 20:58, edited 2 times in total. Hey, you're making this in unity? Well I'm used to working by myself, but I'm not completely opposed to it. What's your preferred medium? (i.e. coding, graphics, etc) Also, would you have an interest in a post-Keen 64 project? Wow, someone listened to me. Never had that happen before. Anyway. Looking cool so far, I can definitely see the difference in control. Gravity seems fine now, can't wait for the next development. That's like the coolest idea! Do it!!! Lava89 wrote: Well I'm used to working by myself, but I'm not completely opposed to it. Idunno, I just downloaded Unity a week ago and need something to play with.